While I have been trying to keep up to date on my genealogy writing at BellaOnline, I have gotten very behind here on my personal blog, Gtownma’s Genealogy. I have set a 2013 New Year’s goal to try to write more often. Today I will write my goal of brick wall’s I’d like to solve this next year, should I be so lucky. Pleasant G. Alfred Cox from Alabama who may have died in Arkansas right after the Civil War. Would like to know more about this Civil War veteran, one of my direct line ancestors. Elizabeth Garris who married Adam Fralick, then Jacob Ruppenthall around 1850 when Adam died. I want to know Elizabeth’s ancestry. She resided in Autuaga County and Montgomery County, Alabama. 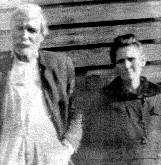 William & Mary Ann Roten from McNairy County, Tennessee. Anything on these two would be exciting, especially Mary’s maiden name! One thing I have been reading alot about lately is the importance of putting our ancestor’s in historical context. I would like to go back to some of the families I have documented and add more historical facts for them. “Meat on the bones” I have heard it often referred to. And, of course, let’s not forget to cite our sources. Seems like most of us learn the beginning steps of genealogy on our own personal families. It is not til we are deep into our families or doing it for someone else that we realize, the “lightbulb” goes off, that we need to be citing our sources. I desperately need to revisit my families that I started genealogy with and add those missing citations and hope I can refind them. I also have many friends I have done family histories on that I would love to revisit, especially now, as I stated earlier, so much has been added to help us in our research. I also hope to be able to do more non-internet research this next year — court houses, library, cemeteries, archives, etc. That is where the excitement truly lies! So, join me in 2013 in working more on our personal genealogical lines. Set a goal to do it weekly or monthly. I am hopeful to spend at least one weekend a month on my personal genealogy.